Last night in Hong Kong for 27th Anniversary of the Tiananmen Massacre. Remembrance is not only for those who died, injured, jailed, exiled.. But for each one of us to reflect on where we stand. Their compassion in action gifted us at least a reflection. For China’s search for modern identity over more than a century, the call of 1989 Protest is a much needed balance to economic success. Money is an effective way for attention, but not a sustainable path to Respect that China has been yearning for. Middletails have multiple dimensions, streamlined UGC as discussed in this New York Times article is just one of them. Time, subject, genre, among others are dimensions that each would have more than 1 midtail. For theater distribution for movies, Black Knight would easily insure a bankable midtail of Batman movies; and StarTrek 2009 the same to its own. The Chinese people want democracy. The Western world wants China to be democratic. But “will China be democratic?”- this is the key question, and still an open question…. In this article the focus will be on four crucial factors – the political, the economic, the cultural, and the external environment – as they relate to the overall process of democratization. These four factors are independent variables. They are likely to provide both favorable and unfavorable conditions for China’s democratization. But the mere existence of favorable conditions does not create a democratic system; only people can do that. Given certain conditions, the actual installation and consolidation of democracy require a spark – the courage, commitment, and skills of the democratizers. 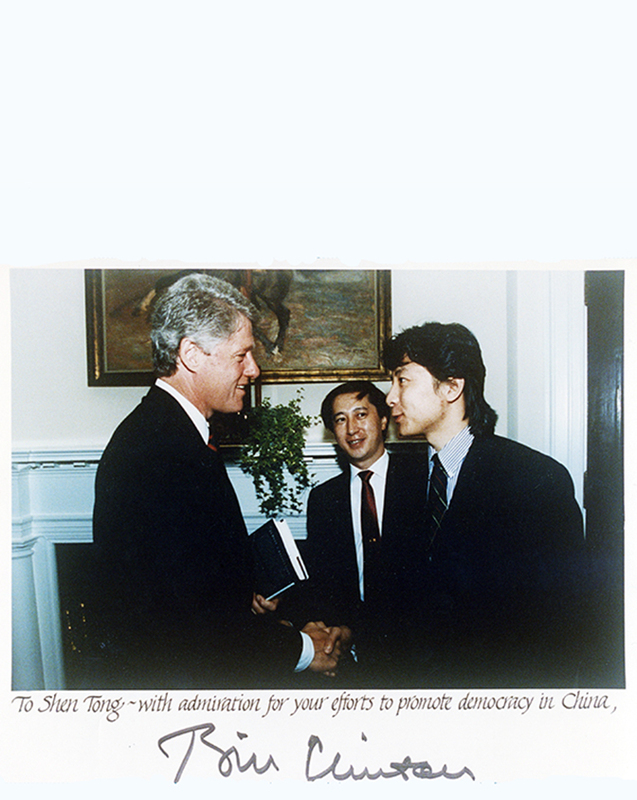 B: I shouted “Down with Deng Xiaoping!” during the 1989 Tiananmen Square events. How about you? A: Isn’t that funny? I was arrested in 1976 by the “gang of four” after the pro-Deng demonstration in Tiananmen Square, and here I am. I was just moved to this cell. A long pause. Both turn to the third prisoner. C: I am Deng Xiaoping. This joke, popular in China after 1989, is a reflection of the political confu­sion of Chinese society and, more important, the frustration. China has been undergoing deep political and social change in every corner of society, from the central government to the provincial powers, from the cities to the countryside, from the civil bureaucracy to the military; and the upheaval can be traced – in particular – in the dissolution of ideology, the decentralization of power, the emergence of civil society, and the rise and fall of political elites. From the outset, communist ideology has completely dominated the declaratory policy of the regime. It has been the prime mover behind the totalitarian social system. Even today, in the form of the so-called “four principles,” it is still the equivalent of the first ten amendments of the Chinese Constitution. Nevertheless, ideological disintegration has been going on at all levels of society…. A society is forming separately from the state in China. The state’s economic and political interests depend on fundamental changes, and these changes gradually will erode the power of the current regime. So far, there appears to be no way for the regime to resolve this dilemma. These trends form favorable con­ditions for the breakdown of the regime and its replacement by new power struc­tures. If and when the breakdown occurs, the country then has to face a choice among various possible replacements – and one of them, of course, is a democratic regime. At the crossroad of history, when the old system is gone and a new regime has to come into existence, the role of political elites becomes decisive. The masses may or may not directly participate in the effort of ending the old regime, and also may or may not be ready for the replacement. The masses become decisive when the question is that of the consolidation of the new regime. Democracy, as generally and traditionally defined, is a political system whose most powerful collective decision-makers are selected through fair, honest, and periodic elections in which candidates freely compete for votes and in which virtually all the adult population is eligible to vote. For such a political system to come into existence, a necessary precondition is consensus by the political elites – either in the form of a common belief in certain fundamentals or of a procedural consensus on the rules of the game. In China’s situation, it will be far from easy for the various political forces to reach agreement on the precise shape of a new post-communist regime. Thus, to measure the prospects for democracy in China, it is important to ask whether the political elites can reach at least some procedural consensus on the rules of the game. Will they be prepared to participate, compete, and compromise in the political game, and to admit the diversity of political views and the existence of different political oppositions? When the cost of wiping out other political forces is too great, political elites may well make the effort to maintain a system in which relatively equal opportunities are provided to all the participants for their mutual benefit. Democracy may not be the outcome leaders desire most; but-it may well be the outcome that is least unacceptable. Arguably, it will be in the best interest of all the existing and emerging political forces to maintain basic stability, to avoid a complete breakdown of social order, while sustaining economic growth. In this sense, after the death of the aging hard-liners when conservatives can no longer dominate the central government, different forces in the country will all have a vested interest in preserving stability; and because no single political force is likely to be dominant, compromises among them can be expected. This readiness to compromise is necessary for the installation of a democratic regime, but it is not sufficient. There are several other possible directions the country might take: they range from a communist reform regime to various types of authoritarianism, with some aspects of liberalism and pluralism mixed in. Some of these possibilities may lead to the establishment of a genuinely democratic system; some may not. Which direction China takes will depend also on such variables as the cultural context, economic factors, and the external environ­ment. The criteria of the cultural context for democratization are even less clear than the political, economic, or external conditions. Here the emphasis will be on Chinese cultural traditions generally; on new cultures and their expansion in China; and on the development of what Almond and Verba have defined as a “civic culture” in China. Traditional Chinese culture is dominated by Confucianism. Neither Taoism nor Buddhism are intrinsic to people’s daily lives. But the Confucian tradition has been enduring and deeply rooted throughout Chinese history. It comprises, in effect, a set of norms for individual and social behavior. Even communism, in its Chinese form, had to adapt to this set of norms: Jin Guantao (in The Chinese Intellectual) defines Maoism as confucianized communism. The adjustment established a new tradition, in which the pragmatism of the old tradition was overlaid by the new communist rhetoric, with Leninist and Stalinist political operational models. In essence, elements of the mainstream Confucian tradition remained as the core of the new system. The new Maoist tradition changed some of these values, especially during such periods as “the Great Proletarian Cultural Revolution,” when families and communities were divided by political differences. But the nature of the two are still the same. In the new tradition, there can be differences of political views in the power structure, but these inevitably lead to internal power struggles. One side has to be right and the other wrong, and the system does not allow for the existence of the defeated party. There are no opposition parties, but only hostile political forces. When such competing forces co-exist, there must be a fatal struggle between them. But in the post-Mao period, the Chinese people experienced the reestablishment of power of Deng Xiaoping. Meanwhile, new values took root because of the open-door policy and the emerging market economy. This was particularly the case among the young who grew up during the post-Mao period, with little or no memory of the bitterness of the Cultural Revolution. They experienced the cultural diversities of a society in transition: the older traditions, imported Western values, and the new emerging pop culture. Individualism is the trademark of this free-economy generation – which also is the pioneering central force of the 1989 movement. As for the future, with all the political and social changes now in ferment, the environment for the expansion of individualism predictably will continue for generations to come. The government’s attempts to control burgeoning religious organizations largely failed. Severe religious repression could not stop their activities, but rather forced them underground. Continuing expansion of Christianity in China can reasonably be expected. But how far, in terms of percentage, the expansion can go in Chinese society, and how important it will be for the democratization process, are open questions. For the consolidation of democracy (if it can be installed in the first place), the development of civic culture is a crucial factor. Civic culture can be defined as a coherent matrix of interpersonal trust and personal life satisfaction in a society. It has been argued that a higher ranking on this scale preserves and enhances democracy in any given society. This tradition prevents both dialectical rationality from developing and anti-rationalism from spreading. It forms a mode of thinking based mainly upon the Confucian tradition, shaping the Chinese people’s psychology into the “golden mean” of calmness with reversed passion: a tendency against violence or abstruse thinking; toward understanding and history;… aiming at preserving harmony and stability in the current organic social structure. It emphasizes interpersonal relationships. Scholars like Jin Guantao believe that this tradition can be reconstructed over time and that most of the educated Chinese will still instinctively follow it. The economic factor overlaps with the political. In an authoritarian regime, either poor economic performance or rapid economic growth can stir up popular dissat­isfaction and resistance to established power. It has been argued that increasing wealth often results in a higher level of education, a general acceptance of progressive rather than revolutionary means of change, and new centers of power outside the state that encourage the evolution of civil society…. Economic development has been the primary and steady force behind all other social and political changes in China’s era of reform. The pace of economic growth has been stunning: there are clear, continuing improvements in levels of consumption. Both the regime and the people want economic reform to continue smoothly. For the Communist regime, the desire, or the fantasy, has been political repression in tandem with a free and strong economy. Economic reform started in the countryside and then spread to the cities. The responsibility system for land management and the contracting system for local government and urban industrial enterprises moved the economy from a centralized planned system to a partial free market, with five forms of ownership: state-owned, cooperative, private, joint-venture, and foreign. Regions with fast economic development led to the creation of special economic zones primarily in the south and coastal areas…. If we look at China’s economy more closely, we find that the miracle was mainly an outgrowth of the non-state-owned sector of the economy. As was pointed out earlier, while the industrial output of the state sector increased by 81 percent from 1978 to 1986, that of cooperative-owned enterprises increased 220 percent. Privately owned enterprises had an even higher output. Without the initiation of the reform program by the government, the devel­opment of all these non-state-owned sectors would not have been possible (al­though the reform in the countryside started almost spontaneously). But, as the opportunity was provided for continuing development, the privatized economy with a market-oriented system quickly gained its own momentum. This was demonstrated by the economic situation after the 1989 Tiananmen crackdown, when the central government tried to contain the newly established mixed system in the centralized model. And it was to some extent successful – but with an ironic twist. In 1989, with the arbitrary imposition of political control over the economy, the growth rate did turn out to be only less than half the usual – about 4 percent…. Reform opened China to the world of information and high technology. The demand increases for information of every variety. Domestic sources of news and other kinds of information, and their means of delivery, have been controlled tightly by the government, of course. Yet, during this period, alternative sources of information have become available, especially the international news media via short-wave radio and foreign magazines that are available both legally and illegally. People can afford more sophisticated radio equipment to get around gov­ernment jamming; the southern provinces can easily receive radio and TV programs from Hong Kong and Taiwan. And with the increase of social mobility and various communications vehicles, information travels very quickly once it gets into the country. The Voice of America, British Broadcasting Company, and other interna­tional Chinese-language programs transmit to China on a regular basis. Since the changes in the former Soviet Union, even Radio Moscow and Radio Pravda have been providing some valuable objective news for the Chinese people. Important international newspapers are also available in limited numbers. Hong Kong newspaper, magazines, and other publications have become one of the most im­portant alternative news sources in China. There are also publications that are sent in by exiled dissident groups. Except for the Hong Kong publications, most of the other news sources focus mainly on international events. It is important that the Chinese people understand the wider world objectively; perhaps even more important is that they receive reliable information about their own situation. “Local” information coming in from the outside has become an important part of Chinese life – especially because the regime would prefer to provide no coverage at all, for instance, regarding demonstrations in one or another region, or the situations of well-known dissidents in China or in exile. For people in a totalitarian country like China, balanced, objective news cov­erage contrasts sharply with government propaganda. Such news sources were blamed by the Chinese government as the “black hand behind the scene” of various pro-democracy movements. The authorities attacked for the obvious reason: in a country like China, truth, if different than government propaganda, can upset and even incite. The external areas that influence China most immediately are Hong Kong, Taiwan, South Korea, Japan, and Southeast Asia. Most of them have been developing business relationships with China. Most Southeast Asian countries generate neither favorable nor unfavorable pressure for China’s democratization. South Korea and Japan are the same. Actually, by engaging in normal business with China after the 1989 crackdown and in other ways cooperating with the Chinese government, Japan has been viewed mostly as a negative factor for China’s demo­cratic change. Changes in the former socialist countries have significantly influenced China as well. The democratization of Eastern Europe and the former Soviet Union was very encouraging in the first instance. Difficulties in consolidating the new systems, especially economic problems, have made the Chinese people more cautious and reserved in their enthusiasm. But these problems have not discour­aged the democratizers for China; on the contrary, the first-stage successes of the Eastern Europeans and former Soviets have proven to the Chinese that basic po­litical reform can be achieved. The difficulties these countries are facing simply make the Chinese activists think more deeply about the long-term prospects for China’s future. All variables and imponderables considered, it is probably safe to predict that a fundamental political change will occur – perhaps quite soon – that will end the current regime in China. Because of widespread dissatisfaction not only among the people and rank-and-file party members, but also party cadres, the breakdown of the current regime also will substantially dissolve the Communist party. Pessimism among party cadres has been reported (in The Press Freedom Guardian) to be as high as 35 percent. Meanwhile, opposition forces keep growing in China and in exile. When the breakdown of the old system occurs, even taking all uncertainties into account, a significant part of the highly educated Mainland Chinese students now overseas will return to China. There are about 100,000 of them in the United States, Canada, Australia, East and West Europe, and Japan. Most of them stayed in these countries out of fear of political persecution and because of the hopeless employment opportunities under the current regime. They will systematically introduce Western technologies as well as Western democratic values into their homeland. Looking at China as a whole, it remains quite unclear whether, after the regime breaks down, democracy will be installed. But when the possibility of regional autonomy after the breakdown of the current totalitarian political structure is taken into account, the situation will look different. For one thing, in the regions that already have entered the upper range of the transitional economic zone, the political, economic, external, and eventually cultural conditions are favorable to the installation and consolidation of democracy. Then, too, the interdependency of different regions will create a snowball effect. Developed regions with something close to stable democracy will favor the expansion of democracy into under­developed or developing regions. Economic and political ties between the two kinds of regions will make it difficult for the latter type to escape the changes. Meanwhile, regions like Tibet and Xingjiang Wigur (also known as East Turkistan) may break away, or at least remain as strongly autonomous entities. Their cultural traditions and economic and political conditions will not much influence the democratization of the rest of the country either way. There is one factor that makes predictions about the future of China very difficult, and that is the involvement of the military forces in the transition pro­cess. If the process remains relatively stable and peaceful, for instance, the army may be expected to stay relatively aloof. But this conclusion is tenuous. There are a great many military officers with political ambitions also waiting for the death of the old guard at the top of the military hierarchy. Whether the civilian political elites can reach compromises to co-exist with military leaders, with the inevitable shift of the army’s role in the country, is a question that is impossible to answer now with any certainty. And so the question mark remains in the title of this article. But there are grounds to hope, on the basis of trends already underway, that the auguries for the future are – on balance – favorable to a democratic China.